Study examines the impact of parental religiosity on child development. (Feb. 6, 2019) -- Do children raised by religious parents have better social and psychological development than those raised in non-religious homes? 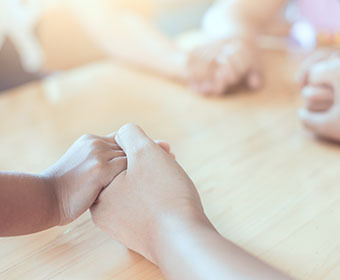 In a new study, UTSA researchers found that religion can be a mixed blessing for children as they get older. John Bartkowski, professor of sociology at UTSA, Xiaohe Xu, professor of sociology at UTSA and chair of the Department of Sociology, and Stephen Bartkowski, from the Office of Institutional Research and Effectiveness Services at the Alamo Colleges District, recently published an article called, “Mixed Blessing: The Beneficial and Detrimental Effects of Religion on Child Development among Third-Graders” in the journal Religions. The team analyzed data from the Early Childhood Longitudinal Study (ECLS)-Kindergarten Cohort to complete the study. They examined the effects of parents’ religious attendance and how the religious environment in the household (frequency of parent-child religious discussions and spousal conflicts over religion) influenced a nationally representative sample of third-graders. They reviewed the children’s psychological adjustment, interpersonal skills, problem behaviors, and performance on standardized tests (reading, math, and science). They found that third-graders’ psychological adjustment and social competence were positively correlated with various religious factors. However, students’ performance on reading, math, and science tests were negatively associated with several forms of parental religiosity. The findings suggest that parental religiosity is a mixed blessing that produces significant gains in social psychological development among third-graders while potentially undermining academic performance, particularly in math and science. This research builds upon a previous study conducted by Bartkowski and colleagues. Published in 2008, that study was the earliest to use national data to analyze the impact religion has on child development. That study found that religion was associated with enhanced psychological adjustment and social competence among primary school-age children (kindergartners). Bartkowski also discovered that religious solidarity among couples and communication between parent and child were linked to positive development characteristics while religious conflict among spouses was connected to negative outcomes. Bartkowski said there are many ways to pursue well-rounded development, and religion is only one avenue. “If it takes a village to raise a child, religion occupies an important place in that village. But it certainly doesn’t have a corner on fostering positive developmental trajectories for children. In fact, religion may be best paired with other community resources such as academically oriented school clubs and activities,” he concluded. Bartkowski also highlighted one notable limitation in their recently published study. “Some religious groups may more effectively balance soft skill development and academic excellence than others. Regrettably, our data set does not inquire about denominational affiliation, so we cannot say if children from Catholic, Protestant, Mormon, Muslim or other denominational backgrounds are especially likely to strike the delicate balance between social psychological development and academic excellence,” Bartkowski explained. He said further research is needed to determine if some religious groups are better at balancing interpersonal skill development and academic capability. Bartkowski said a major takeaway from this new study is that religion is an important influence, generally for good and sometimes for ill, as children navigate their way through the grade school years. Learn more about the UTSA Department of Sociology. Lean more about John Bartkowski.